Here’s a fun Tripawd exercise you can do right now to help your three-legged hero stay loose and flexible: cookie stretches! Cookie stretches are great for dogs who are not showing signs of acute back or neck pain. Do this first thing in the morning before a long walk. Your dog will love getting a treat to start the day! Remember, the goal is to stretch from front to rear, not actually turn. Do one side, hold for fifteen to twenty seconds, then do the other side. Repeat three to five times, once or twice daily. You don’t necessarily have to use food to bribe your dog. Try using your dog’s favorite toy for this game. Or a low-cal carrot or other non-fattening food. Remember: every extra pound on a dog is like five on a human! Also, don’t force your dog into a stretch and if s/he shows signs of tiring, stop, you’ve gone too far. Some dogs will need more time to move into a deep stretch. Ask your vet if you have any questions about this exercise. 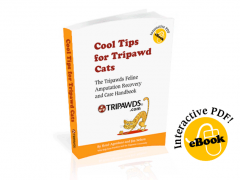 Want to learn more Tripawd exercise tips? 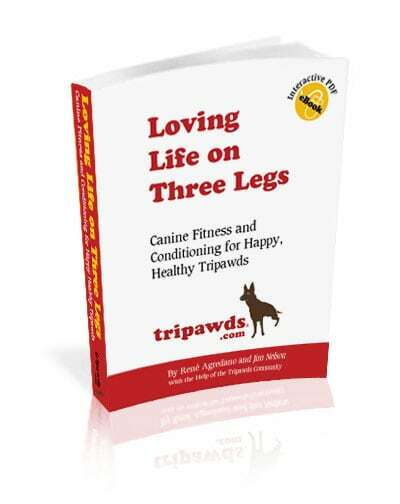 Check out our e-book, Loving Life on Three Legs! Surgery recovery and pain management. Rehabilitation therapy and fitness games. Healthy diet and nutrition advice. Case studies of dogs loving life on three legs! Exercise routine and nutrition worksheets. Check out Loving Life on Three Legs today! Also, the new Canine Tripods Fitness e-book from Wizard of Paws is definitely worth the investment too! Developed by renowned canine fitness expert, Dr. Debbie Gross, DPT, MSPT, Diplomat ABPTS, CCRP. 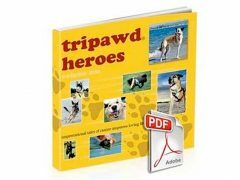 this Tripawd-centric course is jam-packed with everything you need to know about keeping your front or rear-leg amputee dog fit and injury free. We give it three-paws up! Bravo Wyatt! Look how nice and flexible and strong you are! So proud of you!! !